For the first time, the annual Aberdeen Business Management Benchmark Survey found that more organizations are willing to consider a cloud solution over an on-premises solution for their next enterprise resource planning (ERP) deployment. In a recent webinar, Aberdeen ERP researcher Nick Castellina shared his findings on the challenges faced by manufacturers today and offers solutions. Many challenges are related to an increased need for better communication internally and externally due to business expansion across new geographic locales. Other challenges are related to the need for better access to key information so growing companies can be more agile in decision making. Today’s ERP deployment methods can help solve these problems. 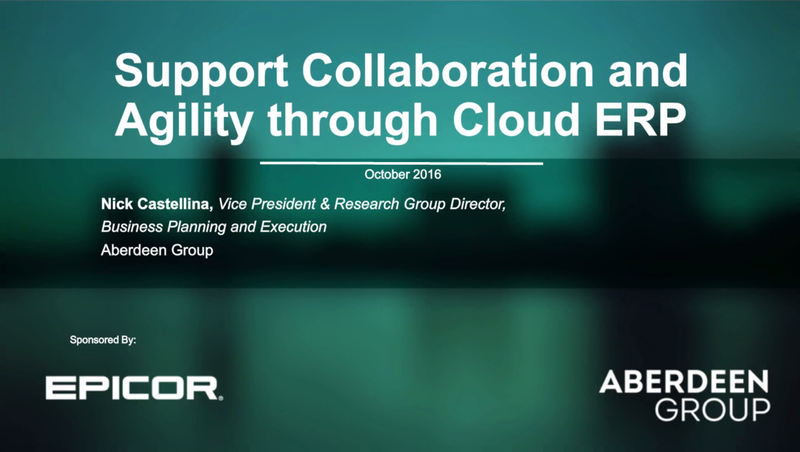 If you’re a stakeholder in your company’s ERP solution and you’re not in the cloud, this webinar recording is for you.